Tyler Richardson, a Vale High School freshman, is heading to the first-ever OSAA girls wrestling state championships. Richardson competed at the OSAA Girls Northern Regional tournament on Feb. 2 in Hillsboro and claimed first place in the 140-pound weight class. She will compete in a four-person bracket at the championships next weekend in Portland. VALE – Tyler Richardson is a pioneer. The 15-year-old is a trailblazer in high school wrestling who reached the top spot at the state level, when that achievement wasn’t expected to happen at all. 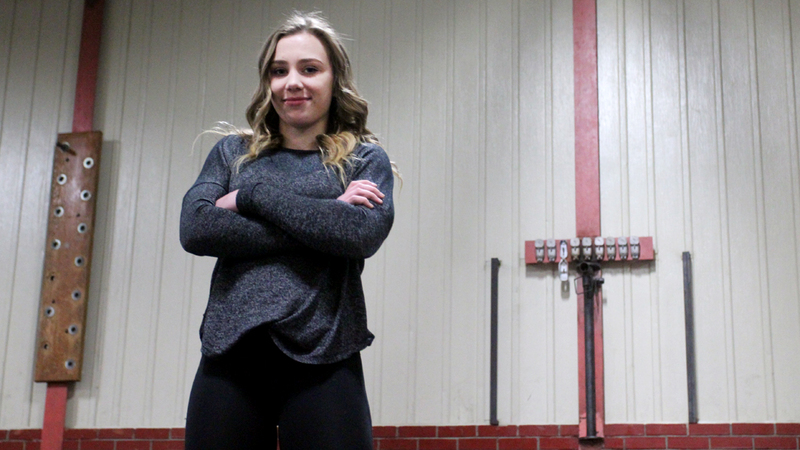 The Vale High School freshman is the Vikings’ first and only female wrestler to qualify for the inaugural Oregon School Activities Association girls wrestling state championship, set to be held next Saturday at Veterans Memorial Coliseum in Portland. Richardson, who started wrestling three years ago as a seventh-grader at Vale Middle School, landed a spot to compete in the 140-pound weight class at the state championships after placing first at the OSAA girls northern division finals in Hillsboro on Feb. 2. Next weekend, Richardson could very well become the state’s No. 1 female wrestler in her weight class. She has only lost two matches in her first season of all-girls high school wrestling and was two-time state champion in her weight class during middle school. Richardson will be one of 40 Oregon female wrestlers in 10 weight divisions to participate in the landmark meet in Portland. All of the weight classes have four-girl fields, according to brackets on OSAA. She is deeply proud of what she is doing, bucking tradition and joining a sport that has not welcomed females for long. Richardson, though, also acknowledges the effort is hard work. Richardson didn’t take the usual path to Vale’s wrestling room. She got into wrestling because she was looking for a way to get better at jiu-jitsu, which she started learning through her father at age of 8. Richardson’s father, Stephen Capps, who co-owns the Brogan Jiu-jitsu & Dance Fitness Center in Vale, said one of the coaches at the center suggested that wrestling would help her jiu-jitsu. Little did Richardson know that she’d find a passion within wrestling and have the ability to beat top-level wrestlers. Vale wrestling coach Jim Schaffeld, who oversees boys and girls, said Richardson showed wrestling talent from the start. Richardson is the Vikings entire girls wrestling team, one of many in Oregon that formed this year. Ontario and Nyssa also have girls wrestling teams this year, each having more than one athlete. Schaffeld said Richardson’s unique approach to wrestling and tenacity on the mat makes her a dangerous foe not only against girls but also with the boys. Richardson competes with the Vale boys varsity team during the season. In those matches, she wrestles at 145 pounds, and she is 13-11 this season. Against other girls, Richardson is 15-2 in the 140-pound class. Richardson placed second in the 140-pound class at 2019 Rollie Lane Invitational in Nampa. She then traveled to Washington, where she wrestled her way to the title at the Othello Lady Huskies Invite. She took the mat again at the Hood River Elks Ladies Tournament and placed second after Elena Kroll from Hood River Valley High School pinned her. But Richardson didn’t have to wait long before a rematch, as she won 19-2 over Kroll just seven days later at the state qualifying tournament in Hillsboro. Despite all of those achievements, Schaffeld said something else stands out about Richardson in the wrestling room. Schaffeld and Richardson both agree that jiu-jitsu background has been a big benefit. The coach said she has a high level of mental toughness and she has good balance. “I wasn’t necessarily stronger. I just had a different background,” she said. But Richardson’s father attributes his daughter’s success to her hard work and drive to succeed. A performer, Richardson loves competition and the chance to push herself. This was evident in her off-season endeavors, as she runs track and field in the spring to keep up her cardiovascular fitness, practices jiu-jitsu through summer, and works on her takedowns and techniques just before the start of wrestling season. Richardson said she likes the discipline wrestling demands, as well as the similarities between wrestling and jiu-jitsu. She also loves where the sport could take her. “I can get a career a lot easier with wrestling, and I can travel and go to more places through wrestling,” Richardson said. Richardson attributes her success to her supporters and teachers. She said her father is her greatest coach and biggest supporter, as he’s always there to watch her at every practice and tournament. We count on readers to subscribe and support the work of professional journalists delivering high quality, accurate, local news to Malheur County. Our digital service is just $5 a month and includes our newsletter, alerts, and around-the-clock access to our website news. Subscribe in a few easy steps: SUBSCRIBE.